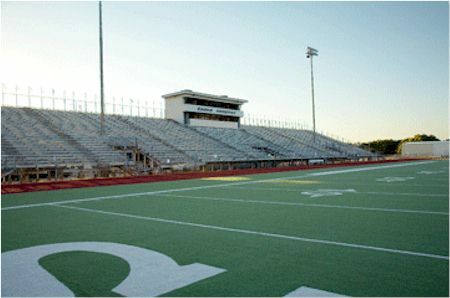 Design drawings were unveiled today for the construction of a new high school football stadium in Texas that is slated to cost $60 million. 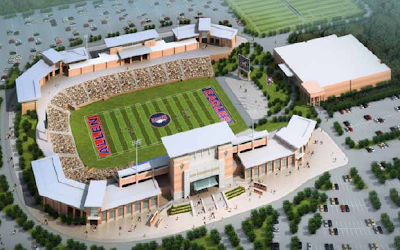 The stadium project is for Allen High School, one of the largest secondary schools in the state of Texas, located in one of the wealthiest areas of suburban Dallas. The stadium is just one (albeit, huge) part of a $120 million bond package, which included $23.3 million for a performing arts center, that passed a town vote in May of 2009 by a 26-percentage-point margin. Apparently, the money used for both projects is strictly confined to capital improvement projects and, lest you think the money would be better spent elsewhere, cannot be implemented for general education purposes. needed to take this shot. The current facilities at Allen High include an 8,000 capacity stadium (temporarily expandable to 14,000 seats) that was built in the 1970s and a climate-controlled indoor activities center that has 50 yards worth of football practice space. According to this report from the county school district, the new stadium will be an 18,000 seat facility with reserved and general admission seating areas, a two-level press box, two scoreboards, a wall of honor, and an upper deck. Amid concerns that this kind of stadium - and the its cost - would raise eyebrows across America, Tim Carroll, public information director for the district, noted that "(The cost) may appear high to other parts of the country, but it compares to what people are doing here. It becomes an economy of scale." Thank you, Jerry Jones. 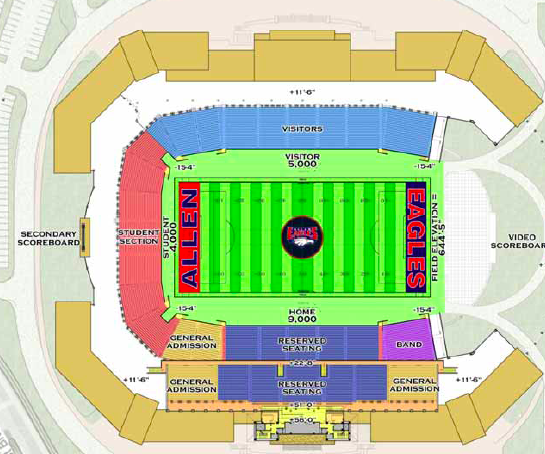 Reserved sections seats will be sold as season tickets. In all, the project is slated to be completed sometime in 2012, proving once again that everything - from high school football to history - is a little bit different in Texas.